DMR is a full service lettershop, capable of meeting all of your direct mail needs. If you've received it in the mail, DMR has the means to process it. If your mailer needs to be wafer sealed, we have three wafer seal machines capable of sealing inline while we address the piece, or offline if need be. If your envelope needs to be stamped, we are able to affix stamps at high speeds with our machinery. 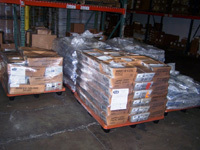 We have folding and inserting equipment to accurately prepare envelope mailings. To go with a more personal feel, DMR can prepare a match mail within our hand department. • Weldtron sealer & Oven • Neopost IJ110 • Challenge 30"